This article gives you complete information about water polo game. This article includes details about skills and positions of players in water polo game. More details about Equipments used for playing water polo game is also quoted in this article. Water polo is an interesting Water sport event which requires some good skills in water and swimming ability. Water polo game consists of six players and one goal keeper in a team. The winner of water polo game is decided on the basis of goals scored like football game. The players must have high swimming skill to play this game. Hand is used in scoring goals. Like football substitutes are also allowed in Water polo. Water polo is approved as an Olympic event. The time of Water polo game depends on the tournament type. In Olympics there will be 4 periods in water polo game each period consists of 8 minutes each. 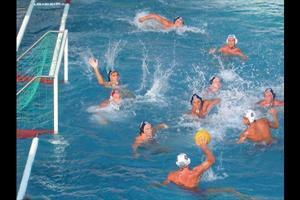 In USA water polo Each period consists of 5 minutes each. there is no specific dimensions in Water polo game. It can be fixed between 20 × 10 and 30 × 20 meters. The minimum depth of water must be set to 1.8 meters. There will be specific balls used for playing water polo game. The color of ball is generally yellow. Two hands are not allowed while playing water polo. Only the goal keeper is allowed to touch the ball with two hands in any time. A water polo player must have passing skills. There are different skills in water polo game. The most important skills required for water polo is swimming skill which will help to pass, block and shot a ball with more control and speed. Passing skill is important in Water polo. Handling the ball and passing between the players is the key in Water polo. Passing skill include dry pass and wet pass. A dry pass is made without touching the water and wet pass is made through the water. Leg movements is also important skill in Water polo for scoring goals. Scissor kick is the major form of leg skill which is required by a player in water polo. A water polo player must have skill to determine the water field and maintaining the positions stable. There are mainly 3 positions in Water polo game and 7 players in a team where different positions are assigned to each player. 1) Offense: Offensive position consists of one player in center, two wing players and two drivers and one point player. Most teams uses line up of 3-3 setup. 2) Defense: Positions of players are same like offense but more importance is given to defense playing rather than attacking. 3) Goalie position: A goalie is the most important person in any game who is to be positioned. A goalie in water polo has got more freedom than any other players, he can touch the ball with two hands and can touch the bottom of the pool. 1) Water polo Ball: Water polo balls are made with materials which is water proof easily used to play water games. Water polo ball size is different in men's, women's and junior water polo games. 2) Water polo caps: Water polo caps are used as a guard by players to give protection for head and ears. Caps also identifies each position of the players. A goalie will generally wear red caps. Caps are also numbered for each players. 3) Mouth guard: Water polo mouth guards are used to give protection for mouth while making a clash with ball or players. 4) Swimwear in water polo: Male players in water polo game wears swim briefs or trunks and female players wear one-piece swimsuit.